The tug Président Brouard was build in England in 1944 as a part of a 180 tugs program, called TID (for Tug Inshore Dock). 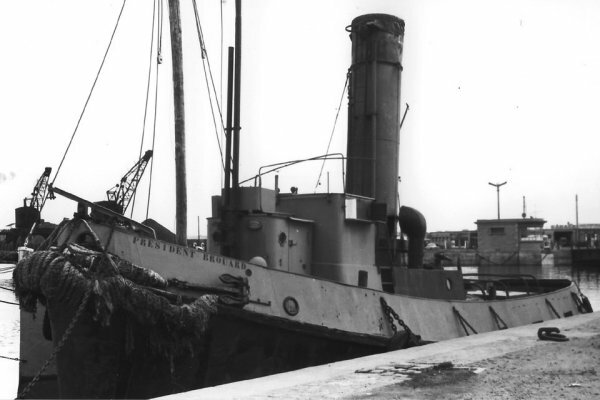 As ten other TID tug, she was given to France at the end of 1945 and was then managed by the Chamber of Commerce of St-Malo. Her name comes from Eugène Brouard died in 1944, who was president of the Chamber of Commerce of Saint-Malo, mayor of Saint-Servan. Sold to Canada in 1965 as President Breward, she could be still in service in Greece. 1966 - Sold to Alexandra Towing Co Ltd and renamed OWER (port of registry Liverpool). Transformed from coke heating to motor.